The Cabin at Killington is the perfect place to spend your Killington vacation. 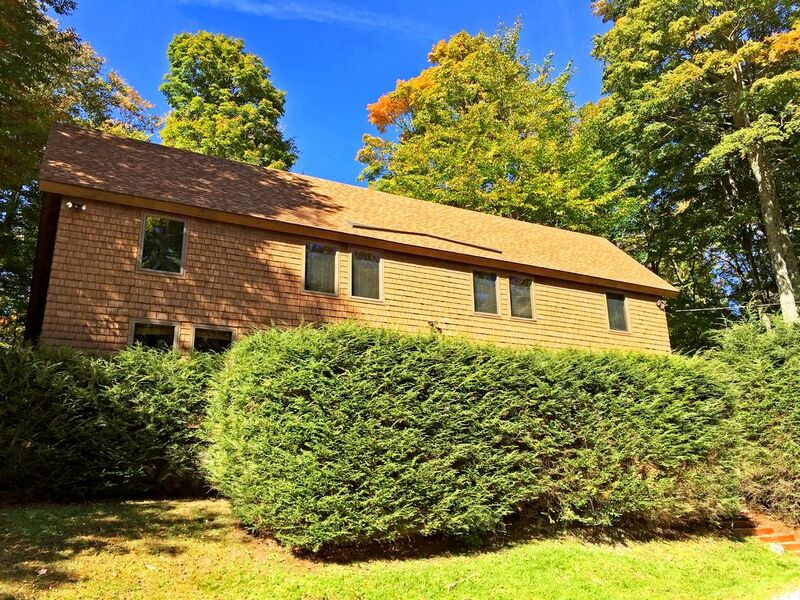 Located just off the main access road in Killington, VT (close to the Killington Market), the house is less than 2 miles to Killington Resort and close to all the shops, bars and restaurants. The left unit features four bedrooms, two renovated bathrooms, a kitchen, dining area, and living room on two floors. The living room has flat screen TV, cable, surround sound, Blu-ray DVD, Apple TV with Netflix, Amazon Alexa, wireless Internet/WiFi, and a wood burning stove (firewood included). There is also a entry way and ski storage closet as well as a shared front and back deck that features a 5-person hot tub, outdoor speakers, and propane BBQ grill. I'm a tech guru who turned into a vacation rental guru. I manage a number of properties in both Killington, Vermont and Buenos Aires, Argentina (long story). Located just 2 miles to Killington Resort with the best skiing and mountain biking on the East Coast. You also have access to many other activities for any season! Located in the heart of Killington Village, you're less than half a mile from the bars, shops and restaurants. Located in the heart of the Green Mountains on a private road. Plenty of privacy and great views. Linen service is optional for $10/person or you may choose to bring your own. Towels are provided with the optional linen service or you may bring your own. The wood burning stove is perfect for cool Vermont nights. Firewood is provided. Both Keurig and drip coffee maker available. We have a selection of board games available for our guests. Stream music through the Apple TV and soundbar. Netflix and Amazon Prime Video are provided for our guests. Large lawn area perfect for summer games or snow angels in the winter. Front and back decks are available for you with table, chairs, sun umbrellas and BBQ grill. We're located just off the main access road and less than 2 miles to the slopes of Killington. Free tennis courts are available at the Killington Rec Center - less than 10 minutes away. The Killington Golf Course and Green Mountain National golf course are both less than 10 minutes away. There is a public pool at the Killington Rec Center, less than 10 minutes from the house. 5-person hot tub on the back deck. The hot tub is included with all peak ski season rentals, but there is a setup charge for non-ski season use (mid-March through mid-December). The house is non-smoking. Smoking is allowed outside only. Any smoking in the house will result in the loss of the entire security deposit. This house was perfect for our large group. Lots of room, with a nice common space. The proximity to the mountain and all the shops/restaurants was a huge plus. We would definitely stay here again. The cabin is a perfect spot for a getaway. The furniture and decor is simple and quality. The kitchen has all the essentials. There are plenty of beds. Wood burning stove was great for a cold night. I would highly recommend this spot for a group of adults on a getaway. Nice place with plenty of beds, clean and comfortable! Having stayed in several cabins in the Pigeon Forge, TN area, I was left feeling underwhelmed by this rental. It was much smaller than I was expecting. Being from Virginia and not the New England area, I was also expecting air conditioning as it was warm and humid when we arrived and had to get by with the provided fans (not the same). The bathrooms were in nice condition, but quite small. The kitchen was tiny and in needed of a remodel. The dishes were from Ikea. The skillet was in sad shape. Nice washer and dryer, but both duplex units share the set, so if both units are rented to different parties, you're going to have to share. The entertainment system wasn't connected and overly complicated to use, 4 different remotes! BTW, the security deposit was quite large for a two-day rental. Seems a bit much when the security deposit is more than the rental fee. The towels provided with the additional linens fee were quite abrasive and small, like drying off with a loofah. But on the plus side I felt exfoliated after a shower. The sheets were fine. Overall, the unit provided a quiet place to sleep, eat, and shower, which in the long run was the goal, but it was far from luxurious and didn't seem to be a good value. Bill, thanks for staying with us and I'm glad that you like the location and amenities. I'm sorry to hear that you seemed to have a number of issues with the home. I wish you would have reached out to us during your stay so that we could have addressed them while you were there rather than having to only respond to them in your review. We do list all the amenities and features in our listing, and the photos and descriptions are up to date and very accurately describe the property and layout. I'm not sure what the problem is with Ikea plates (I'm pretty sure you can indeed eat off them like other plates). We also have multiple pots and pans so I could have pointed you to other options. The entertainment system has a universal remote that controls everything, and there's a guide in the house with instructions. I've never had other guests mention many of these issues, so I'm a bit surprised, but I do wish we would have had the chance to address them for you while you were there. David was very responsive before and during our stay with questions we had. House worked great for 7 of us staying the long holiday weekend. With flowing streams, hidden waterfalls, secluded lakes, quaint villages, breathtaking views, covered bridges, green hills & cool breezes, the Vermont summer seems endless. The Killington Region has many unique areas to hike & explore, with trails for all ages & levels. If you prefer biking you can tour the region along country roads, scenic Rt 100, or ride Killington's mountain trails. There's also fly fishing, horseback riding, kayaking & many other outdoor activities. Culturally, central VT boasts many museums, galleries, areas to shop & historical sites to visit. Just a short drive away is Woodstock VT, a quaint little town with interesting shops & home of Billings Farm and Museum. Or, the outlets of Manchester are a great day trip. Ski: The largest ski and snowboard resort in eastern North America, Killington celebrates its 50th birthday on Dec. 13, 2008 with more than $8.4 million in on-mountain improvements, including the new Skye Peak Express, ski trails, efficiency upgrades to the world's most extensive snowmaking system and expanded environmental programs. In addition to the new Skye Peak Express and new trail enhancements, Killington debuts The Stash, an all natural terrain park located off the shoulder of Skye Peak and accessible by the Skye Peak Express. Killington's Stash is one of only five that exist worldwide and the only one on the East Coast. Plus, a new 500-foot Magic Carpet at Snowshed improves the uphill learning experience for beginner skiers and riders in the Killington Ski and Snowboard School, and Burton Learn to Ride Programs. A new beginner trail and a more advanced trail off Skye Peak also debut for the 08/09 season. • Prices are for the left unit. Please contact us if you would like to book both units. • Stays under 30 days subject to 10% VT tax. • Minimum Rental Age: 25 • Cleaning fee required. • Optional Linen Service (sheets & towels): $10/person or bring your own • Optional Hot Tub Setup Fee: $110 (NO CHARGE for peak ski season weekends mid-December - mid-March) • Check in time: 4pm. Early check in may be available for an additional charge. • Check out time: 10am. Late check out may be available for an additional charge. • Some dates have minimum stay requirements. • Some dates have minimum occupancy requirements for pricing purposes. • Long term stay discounts.